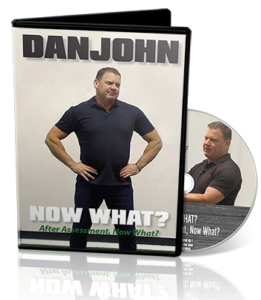 In this clip from his new video Now What?, Dan John details the job of a coach and explains his APE method to take athletes from training to competition. It seems weird to say this, but the Now What? matrix is probably the most important thing I can do for you as a coach. If you’re a fitness person or you’re doing something normal, like a longevity task, here’s the five, six, seven, eight things you need to do for a long time. If you want to be an athlete, let’s be principle based, and let’s judge how we do on those principles. 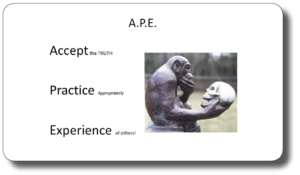 The big question is, how do I take that nice step, and then take you into the field of performance? Here are the principles. Here are the three things you need to do, here are the two things you need to do, and now take it into the field of play. We’re going to stick with our yin/yang model. That’s me, the strength coach, and there’s your technical coach. What we’re going to start talking about is ensuring that you’re at the right place, in terms of your physical tension, your arousal, and your heart rate. This method is called APE, because it has to have a name, otherwise I couldn’t do it. The first thing is A, ACCEPT the truth. There’s an important truth I’m about to share with you. It’s an important truth about performance. Next, I think you need to PRACTICE appropriately. The third thing, this is an interesting thing, is that I want you to learn from the EXPERIENCE of others and yourself. Inside of your life story is how you perform well, and how you perform poorly. My job as your coach is to find out those things that make you tick, and then teach you to make it happen in competition. To make it happen.